Tan Bock Kwee & Sons Sdn. Bhd. (TBKSSB) is a Malaysian incorporated company with a leading position in the civil construction and sanitation sectors. Having developed their own massive local team of adept and dedicated personnel as well as their own fleet of engineering equipments, the company has likewise face many challenges in terms of their security/management aspect. This soon prompts the company to search for a suitable solution for the predicament at hand and this is where TBKSSB sets their attention towards TimeTec Smart Solution. After implementing TimeTec Patrol as the setup for their security management, TBKSSB is confident that our Smart Time Attendance Solution: TimeTec TA will be able to uphold the task of maintaining high efficiency within the company’s workforce. Designed with a cloud-based structure, TimeTec TA is a versatile solution that is applicable even in large corporation such as TBKSSB as being cloud means that our Smart Solution is made scalable regardless of the company’s size. That being said, TimeTec TA also comes equipped with a multitude of handy features that could prepare TBKSSB’s workforce for the Future. For TBKSSB, the highlight is on Paired Staff Movement Analysis Report in which TimeTec TA will generate a report that pairs up any two clockings (Clock-In/Clock-Out) of the day. 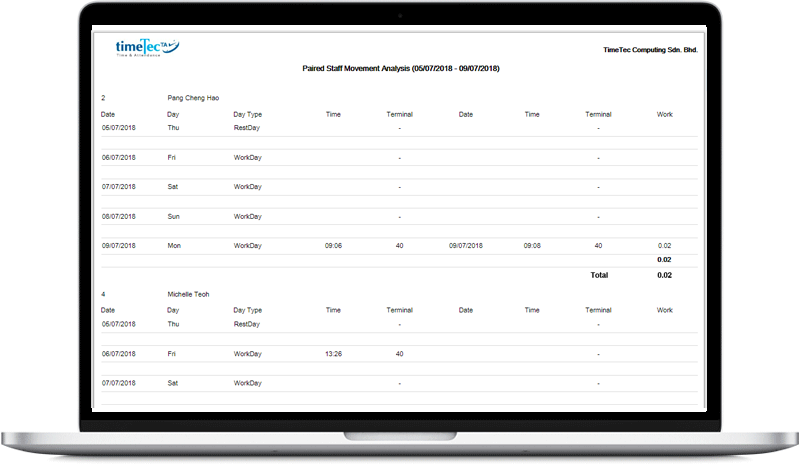 This function is especially useful for a construction company as it allows employers to have a clear overview of the attendance data for better payroll calculation since TBKSSB has many ad hoc staffs operating in their line of work. TimeTec TA Smart Solution is made to help businesses reduce their administrative overhead by eliminating the time spent on manual time card calculations; promoting automation in terms of workforce management. Using both Smart Solutions with TimeTec TA subscribed to over 400 user subscriptions, provided by our Malaysia reseller, My Radions Technologies Sdn. Bhd., TBKSSB can thus rest assured knowing that their security/workforce management are being handled with care in addition to having their records stored safely in the cloud. All roads lead to cloud, start your journey today by visiting our website provided in the link below.